He began theatrical activities as a university student, when he participated in a university production. 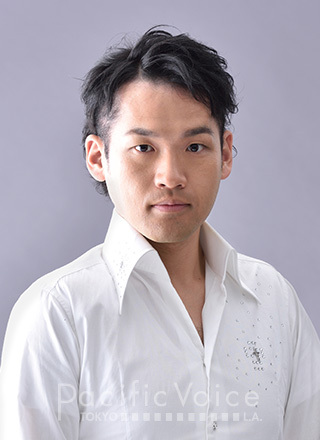 After graduating from university, he joined the Shiki Theatre Company in 2003, appearing in a wide variety of works, ranging from straight plays to family musicals. He has starred in roles such as The Lion King’s Ed the crazy hyena more than 1000 times. For his final role he played Elphaba’s father in the 2009 musical Wicked, concluding his involvement with the troupe following this. Since leaving he has worked freely on various activities, displaying his abilities as the beautiful tenor in the 2010 production of Phantom (starring Takao Osawa), for instance. In addition to this, he featured in the premiere performance of the Korean musical Parure as one of the original Japanese cast members, participating also in subsequent performances. Aside from this, his broad range of activities includes small theatre appearances and the organization of music events.